Tristate Warehousing has got you covered. 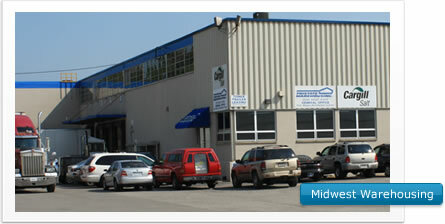 We specialize in Midwest Warehousing solutions. Whether your requirements are large or small, basic or complex, we are your one stop, total warehousing provider . Busting at the seems? Our 500,000 square foot facility, centrally located in the Fort Wayne, Indiana, the heart of the Midwest, will meet your requirements, and more. We offer easy access to both coasts, major transportation routes and most cities. We also maintain an on-site Norfolk Southern rail spur to handle train shipments. Cut your shipping times and costs. Some clients require more than just floor space. Tristate Warehousing specializes in value-added services. We can pick and pack orders and even assemble displays. Send us your product in bulk and we'll break it down, re-label and build per you specifications. We do these things for customers everyday<. Are you in the food services industry? When handling food items, not just any warehouse will do. At Tristate Warehousing, cleanliness is more than a marketing buzzword. House keeping is built into our daily routine. We operate a food-grade quality facility and are ready to service your needs. Need to add freight to the equation, but tired of trying to coordinate two or three different companies on the same project? Tristate Warehousing, in conjunction with ourin-house trucking company, JAT of Fort Wayne, provides a seamless logistics experience. Just one call, and we'll handle your project from start to finish. Location. Location. Location. The Midwest region ,and specifically Fort Wayne, offers low overhead, competitive pricing and great total value. Please, compare our rates with the competition. Tristate Warehousing is here to improve your bottom line. We want to hear from you. Please take a moment to request a quote online or call Jason Ludwig at 260-436-2010. Let Tristate Warehousing be yourtotal warehousing provider.